Welcome to Round 8! We’re playing 2 Rounds of Swiss today before cutting to the Top 32. There was no Day 2 cut so everyone who didn’t drop from yesterday is back today! We’re looking at Table 3 where Rafael Jose Rodrigues de Souza from Recife, Pernambuco, Brazil is taking on Diego Oliveira Hoelzle from Belo Horizonte, Minas Gerais, Brazil. 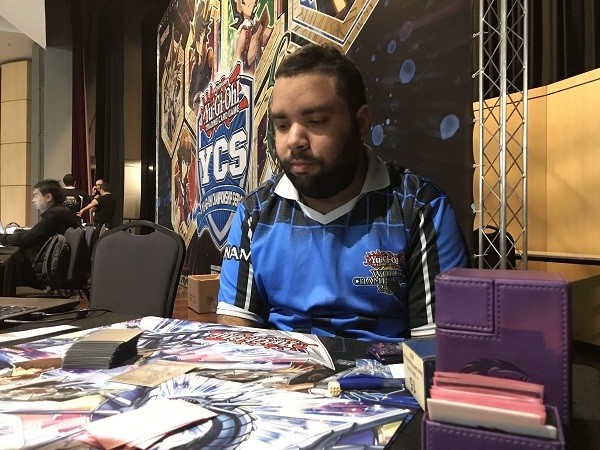 Rodrigues de Souza competed in the Duel Links World Championship this year, so we’ve already seen a lot from him at the highest level of competition. Both Duelists have a record of 6 wins and 1 loss. Rodrigues de Souza has Sky Striker and Hoelzle has True Draco. This will be a resource game that will reward careful planning and execution. It’s time to Duel! Rodrigues de Souza won the roll and elected to go first. He started with Sky Striker Mecha Modules – Multirole and Sky Striker Airspace – Area Zero. He Set a card and used Sky Striker Airspace – Area Zero’s effect but didn’t reveal any Sky Striker cards. He then used Sky Striker Mecha Modules – Multirole’s effect to send the Set card to the Graveyard which was Metalfoes Fusion. Rodrigues de Souza activated Metalfoes Fusion’s effect form the Graveyard, sending it back to the Deck to draw a card. He then Normal Summoned Sky Striker Ace – Raye then Link Summoned Sky Striker Ace – Shizuku. He Set Twin Twisters and in the End Phase Rodrigues de Souza used Sky Striker Ace – Shizuku’s effect to add Sky Striker Mobilize – Engage! from his Deck to his hand. Hoelzle Set a card to the back then Tributed the Set True Draco Heritage to TS Ignis Heat, the True Dracowarrior. He activated Heritage’s Graveyard effect to destroy Rodrigues de Souza’s Set Twin Twisters. Hoelzle then activated Dragonic Diagram, Set a card to the back and used Dragonic Diagram’s effect, destroying his Set True Draco Apocalypse and adding another True Draco Heritage from his Deck to his hand. True Draco Apocalypse’s effect destroyed Rodrigues de Souza’s Sky Striker Ace – Shizuku. 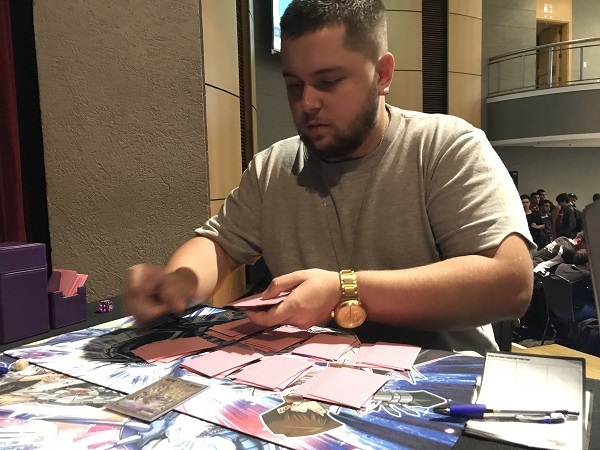 Rodrigues de Souza activated Sky Striker Ace – Raye’s effect from the Graveyard and Hoelzle chained Ignis Heat, adding Disciples of the True Dracophoenix from his Deck to his hand while Rodrigues de Souza’s Raye his the field. Hoelzle activated True Draco Heritage and used its effect to draw 2 cards. Next, he activated Pot of Duality, revealing Pot of Desires, Dinomight Knight, the True Dracofighter and Card of Demise. He took Pot of Desires after some deliberation. He used True Draco Heritage’s effect to Tribute Summon a True Draco, Tributing the Spell to Tribute Summon Majesty Maiden, the True Dracocaster. He then used Terraforming to add another Dragonic Diagram from his Deck to his hand. He activated the new copy of Dragonic Diagram over the first, then activated Disciples of the True Dracophoenix from his hand, using the effect to send 2 copies of True Draco Heritage and True Draco Apocalypse back to the Deck to draw a card but Rodrigues de Souza negated it by discarding Ghost Belle & Haunted Mansion! Hoelzle continued by activating Pot of Desires, banishing 10 cards to draw 2 more. Hoelzle used the effect of Dragonic Diagram, destroying another True Draco Apocalypse from his hand to add True King’s Return from his Deck to his hand. He Set a card then used the Tribute Summon effect of Disciples of the True Dracophoenix, Tributing the Set True King’s Return to Tribute Summon another Ignis Heat, the True Dracowarrior. 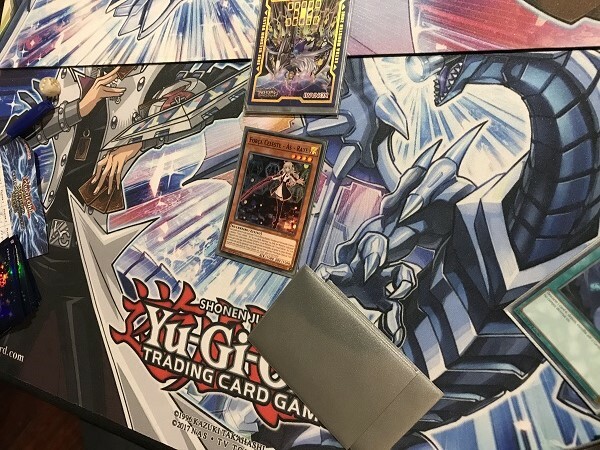 True King’s Return’s Graveyard effect targeting Rodrigues de Souza’s Sky Striker Ace – Raye which Rodrigues de Souza chained, tributing it while Hoelzle chained Majesty Maiden, the True Dracocaster to add Dinomight Knight, the True Dracofighter from his Deck to his hand. Raye’s effect resolved, Special Summoning Sky Striker Ace – Hayate from the Extra Deck. In the Battle Phase, Hoelzle sent Majesty Maiden to attack Rodrigues de Souza’s Sky Striker Ace – Hayate. 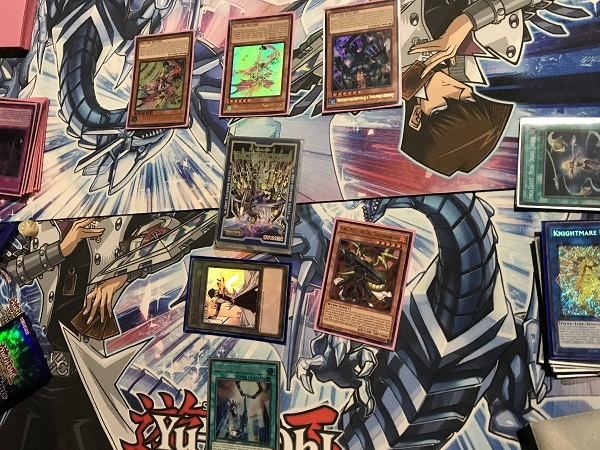 Rodrigues de Souza used Sky Striker Ace – Hayate’s effect to send Sky Striker Airspace – Area Zero from his Deck to the Graveyard while the rest of Hoelzle’s monsters attacked directly, leaving Rodrigues de Souza at 1500 LP. Hoelzle Set a card in Main Phase 2 and passed. In the Standby Phase, Hoelzle activated his Set Anti-Spell Fragrance and Rodrigues de Souza chained Sky Striker Mecha – Hornet Drones from his hand. Hoelzle chained Ignis Heat, the True Dracowarrior to put Disciples of the True Dracophoenix into his hand. 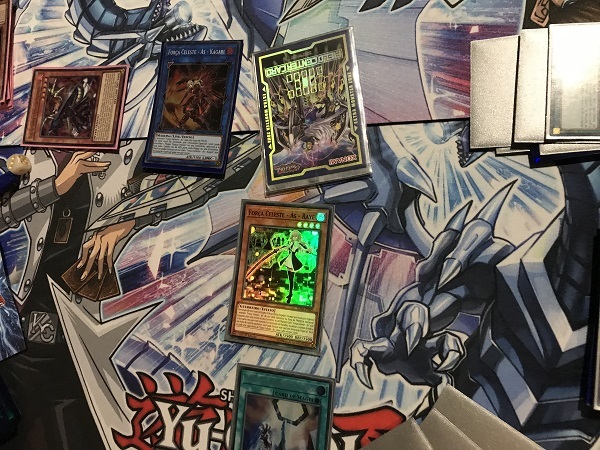 With the Sky Striker Ace Token, Rodrigues de Souza sent it away to Link Summon Sky Striker Ace – Kagari whose effect let Rodrigues de Souza add Hornet Drones back from his Graveyard to his hand. Hoelzle chained Majesty Maiden, the True Dracocaster to add another Majesty Maiden from his Deck to his hand. Rodrigues de Souza used Sky Striker Mecha Modules – Multirole’s effect to send Sky Striker Airspace – Area Zero to the Graveyard then used the Field’s effect in the Graveyard to Special Summon Sky Striker Ace – Raye from the Deck. He used both Sky Strikers to Link Summon Knightmare Phoenix. He used the effect of Phenix, discarding Hornet Drones to destroy Hoelzle’s Anti-Spell Fragrance. Free to activate Spell Cards from his hand, Rodrigues de Souza activated Sky Striker Mobilize – Engage!, adding Sky Striker Mecha – Widow Anchor from his Deck to his hand and drawing Infinite Impermanence, the only 2 cards left in his hand. He activated Sky Striker Mecha – Widow Anchor to negate Ignis Heat, the True Dracowarrior’s effect and take control of it. He used both Phoenix and Ignis Heat to Link Summon Knightmare Unicorn. He used its effect, discarding Infinite Impermanence to spin Hoelzle’s Dragonic Diagram back to Hoelzle’s Deck. That gets rid of the battle destruction protection but he’s still a few Attack points short of clearing any of Hoelzle’s monsters. In the End Phase, Rodrigues de Souza used Sky Striker Mecha Modules – Multirole’s effect, Setting Sky Striker Mecha – Widow Anchor and Sky Striker Mecha – Hornet Drones from his Graveyard back to the field. Hoelzle used the effect of Disciples of the True Dracophoenix, sending True King’s Return, Ignis Heat, the True Dracowarrior and True Draco Heritage back to the Deck to draw a card. With 5 cards in hand and with Rodrigues de Souza holding no cards and all of his Set cards previously revealed, Hoelzle should be able to force the Set cards’ activations and close out the Duel. Hoelzle used the Tribute Summon effect of Disciples, Tributing Disciples of the True Dracophoenix to Tribute Summon Dinomight Knight, the True Dracofighter. He used Disciples of the True Dracophoenix’s effect to destroy one of Rodrigues de Souza’s Set which was chained: Sky Striker Mecha – Hornet Drones. Chain Link 3 was Ignis Heat, the True Dracowarrior and Chain Link 4 was Rodrigues de Souza’s last Set card, Sky Striker Mecha – Widow Anchor targeting Ignis Heat, the True Dracowarrior. Chain link 5 was Dinomight Knight, the True Dracofighter which added True King’s Return from his Deck to his hand. Ignis Heat went over the Hoelzle’s side of the field and Rodrigues de Souza got a Sky Striker Ace Token. Next, Hoelzle Set True King’s Return and used his regular Normal Summon, Tributing the Trap to Tribute Summon Majesty Maiden, the True Dracocaster. He used the Trap’s Graveyard effect to destroy the stolen Ignis Heat, the True Dracowarrior and the rest of the monsters were enough to push through for game! Rodrigues de Souza elected to go first. He started with hand of Twin Twisters, Upstart Goblin, Sky Striker Mobilize – Engage!, Droll & Lock Bird and Sky Striker Airspace – Area Zero. He activated Upstart Goblin and drew another Droll & Lock Bird. He then activated Sky Striker Mobilize – Engage! to add Sky Striker Mecha Modules – Multirole from his Deck to his hand. He activated Sky Striker Mecha Modules – Multirole then Sky Striker Airspace – Area Zero, using Sky Striker Mecha Modules – Multirole’s effect to send Sky Striker Airspace – Area Zero to the Graveyard which in turn Special Summoned Sky Striker Ace – Raye from the Deck. Sky Striker Ace – Raye was sent to the Graveyard to Link Summon Sky Striker Ace – Kagari whose effect let Rodrigues de Souza pick up Sky Striker Mobilize – Engage! form the Graveyard and activate it again, adding Sky Striker Mecha – Widow Anchor from his Deck to his hand. Sky Striker Ace – Kagari was sent away to Link Summon Sky Striker Ace – Shizuku. Rodrigues de Souza Set Twin Twisters and Sky Striker Mecha – Widow Anchor and in the end phase he used Shizuku’s effect to add Sky Striker Mecha – Eagle Booster from his Deck to his hand which he activated on Sky Striker Ace – Shizuku right away. Still in the End Phase, Rodrigues de Souza used Sky Striker Mecha Modules – Multirole to Set Sky Striker Mecha – Eagle Booster back to the field. Hoelzle went directly to the Battle Phase. Sensing what was about to happen, Rodrigues de Souza activated Sky Striker Mecha – Eagle Booster and chained Sky Striker Mecha – Widow Anchor both on his own Sky Striker Ace – Shizuku. As expected, Hoelzle activated Evenly Matched from his hand. Rodrigues de Souza kept Shizuku on the field, banishing Sky Striker Mecha Modules – Multirole and the Set Twin Twisters from the field. In Main Phase 2, Hoelzle activated Terraforming, adding Dragonic Diagram from his Deck to his hand. After the Chain resolved, Rodrigues de Souza activated Droll & Lock Bird to prevent further searching or drawing this turn. Hoelzle Set Disciples of the True Dracophoenix and Tributed it to Tribute Summon Ignis Heat, the True Dracowarrior. Rodrigues de Souza drew Sky Striker Ace – Raye, adding it to his hand of just Droll & Lock Bird. Sky Striker Ace – Shizuku swapped out for Sky Striker Ace – Kagari whose effect let Rodrigues de Souza add Sky Striker Mobilize – Engage! back to his hand which was activated, letting Rodrigues de Souza add Sky Striker Mecha – Widow Anchor from his Deck to his hand and drawing Sky Striker Airspace – Area Zero. He activated Area Zero and activated Sky Striker Mecha – Widow Anchor to take Hoelzle’s Ignis Heat, the True Dracowarrior. He attacked with both monsters then used Sky Striker Airspace – Area Zero’s effect in Main Phase 2, revealing Sky Striker Mobilize – Engage! and 2 other cards off the top of his Deck. He sent the stolen Ignis Heat to the Graveyard and added Sky Striker Mobilize – Engage! to his hand which was activated to add Sky Striker Mecha Modules – Multirole to his hand and draw another card. He activated Sky Striker Mecha Modules – Multirole, Set a card, swapped Sky Striker Ace – Kagari for Shizuku and in the End Phase, he used Sky Striker Ace – Shizuku’s effect to add Sky Striker Mecha – Shark Cannon which was activated on the Ignis Heat, the True Dracowarrior in Hoelzle’s Graveyard, banishing it. Still in the End Phase, he used Sky Striker Mecha Modules – Multirole to Set Sky Striker Mecha – Widow Anchor from his Graveyard back to the field. Hoelzle activated Pot of Duality, taking Evenly Matched. Rodrigues de Souza activated Droll & Lock Bird to stop further searching or drawing this turn. Hoelzle went to the end of the Battle Phase and used Evenly Matched, with Rodrigues de Souza chaining Sky Striker Mecha – Widow Anchor on his own Shizuku. When Evenly Matched resolved, he kept Sky Striker Mecha Modules – Multirole. In the End Phase, Rodrigues de Souza used Sky Striker Mecha Modules – Multirole to Set Sky Striker Mobilize – Engage! from his Graveyard back to the field, giving himself the opportunity to get back into the game. Rodrigues de Souza activated the Set Sky Striker Mobilize – Engage! to add Sky Striker Mecha – Widow Anchor to his hand and draw a card. He activated Sky Striker Airspace – Area Zero, used Sky Striker Mecha Modules – Multirole to send it to the Graveyard to Special Summon Sky Striker Ace – Raye. He then Normal Summoned another Sky Striker Ace – Raye from his hand. Both Rayes attacked directly then in the Battle Phase, Rodrigues de Souza used one of the Sky Striker Ace – Raye’s effect to Tribute it, Special Summoning Sky Striker Ace – Kagari who had enough attack points to send the game into a third and final Duel with just minutes remaining. Hoelzle elected to go first. He Normal Summoned Amano-Iwato and activated Pot of Duality, revealing True Draco Apocalypse, Ignis Heat, the True Dracowarrior and Dragonic Diagram. He took Ignis Heat, the True Dracowarrior and shuffled the other 2 cards back to the Deck. he activated Dragonic Diagram, destroying Evenly Matched from his hand to add True Draco Apocalypse from his Deck to his hand. He Set a card and retuned Amano-Iwato to his hand. Rodrigues de Souza activated Twin Twisters, discarding another Twin Twisters to destroy Hoelzle’s Set card. Rodrigues de Souza then Normal Summoned Sky Striker Ace – Raye and attacked into a clear field. Hoelzle extended the handshake knowing that there were only seconds left before time was called and that he wouldn’t get a Battle Phase to turn things around. Rodrigues de Souza moves on with a 7-1 record!